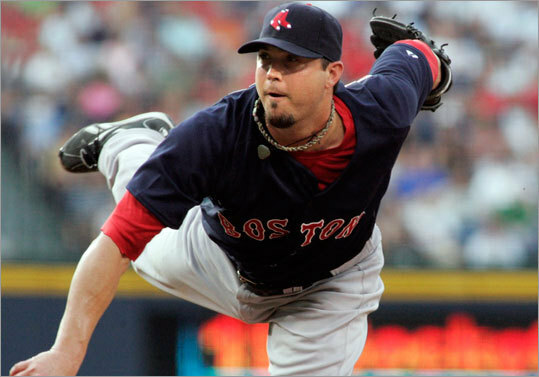 (AP) Josh Beckett extended his record against the Braves to 6-0 with an 0.38 ERA. ATLANTA - As a rule - and a prudent one, at that - manager Terry Francona avoids Josh Beckett when he pitches. That goes for before and during games. Why face that intensity, that competitiveness more than absolutely necessary? That was why Francona was set to send Beckett out for the eighth in a consecutive scoreless stretch that had reached 16 innings. He sent John Farrell, his usual emissary, to get Beckett’s blessing. There must have been relief in the home dugout as Julio Lugo walked to the on-deck circle. Not because of Lugo, but because of the man he replaced. That man undoubtedly engendered hostility from the other side, not only for what he did last night, a 4-1 win, but last weekend, and over his last six starts against them. The Braves will not face Beckett again this season, and they must be relieved. He has thrown 16 consecutive scoreless innings against them, a streak that earned the Red Sox two wins, and seemingly solidified an All-Star spot for Beckett (9-3) in St. Louis July 14. So Beckett stayed in the dugout, Lugo pinch hitting, as the Sox attempted to get an insurance run. They would get two, unfortunate for some of the 48,418 at Turner Field, as the Sox made Francona the ninth active manager to tally his 800th career win. Beckett extended his record against the Braves to 6-0 with an 0.38 ERA and, more importantly, a 5-1 record and 1.24 ERA in his last seven starts overall, which includes six earned runs allowed in one game (the Phillies). Beckett has been working through “some throat stuff’’ all week, and Francona suggested it might have been tonsillitis. “Obviously it would have been nice to feel great, and go another inning,’’ said Beckett, who threw 98 pitches, 70 for strikes, allowed six hits, and struck out six. “My position players had to stay out there through it. It wasn’t the ideal situation for me, but I made pitches when I needed to, and we played good defense. David Ortiz? He had no troubles, though one could be excused for getting stomach pain watching him run toward the dugout steps trying to catch a Jair Jurrjens foul ball in the fifth inning. While Ortiz looked agile at times in his first base engagement - rapidly coming to a close with the end of interleague play tomorrow - it was one uncoiling of his swing that displayed his comfort at least at one place on the diamond. Ortiz turned on an inside fastball from Jurrjens, bashed his eighth homer of the season nearly a dozen rows deep into right field, and provided a 1-0 lead for Beckett. Just as he had last Sunday, when he hit a homer in the first inning off Jurrjens, Ortiz jumped on a pitch and made it count to lead off the fifth. Though the Braves threatened in the third, with men on first and third with two outs, Beckett struck out Chipper Jones looking on a 95-mile-per-hour fastball. The true test, though, came in the fourth. Garret Anderson and Casey Kotchman singled to start the inning, but Beckett got Jeff Francoeur swinging on a breaking ball, and induced a fly to right and a grounder to second to end the inning. Beckett - who had not allowed a run to the Braves in 13 innings at that point - walked off the mound angry at himself for the execution on the pitch Kotchman hit. The frustration led to a fist pump, and a walk back to the dugout in which he appeared to be hollering at himself. He was not quite as dominant as he had been in his last start against Atlanta, one in which he threw 94 pitches in a complete-game shutout. But he was no less effective. The Sox managed to manufacture a run in the six. Or, rather, Dustin Pedroia did. Pedroia doubled to left on a ball that should have been fielded by shortstop Diory Hernandez. But he missed the bounce and it went past him, putting an alert Pedroia on second. Pedroia was awarded third on the first of two balks that he nearly forced Jurrjens to hand him, his dancing around the bag distracting the pitcher. All that was needed then was a grounder to second by J.D. Drew, on which Martin Prado considered throwing home. Most things did last night, with the exception of David Ross’s ninth-inning home run against Jonathan Papelbon. And it worked out for Beckett, other than that intestinal turmoil. He has written an unyielding success in recent days, those scoreless innings piling one upon the next.